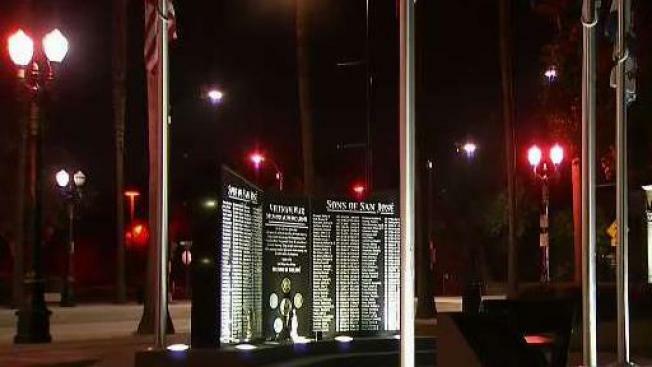 Vandals defaced the Vietnam War memorial in downtown San Jose over the weekend, and it may be permanently damaged, officials with the San Jose Vietnam War Memorial Foundation said. The memorial near SAP Center honoring fallen U.S. soldiers during the Vietnam War was defaced with some sort of paint or marker. The damage was still visible Monday. There are 142 names on the wall saluting soldiers from San Jose who were killed during the Vietnam War. For other war veterans, it felt like a personal attack. "Displeased," Vietnam vet Dennis Fernandez said when asked how it made him feel. "Because there's eight of the guys from [my] high school on that memorial." Fernandez and his wife Sandra helped the foundation build the memorial in 2013. "Vietnam veterans weren't honored when they got home, and so we decided we'd build this memorial so that they could be honored always," Sandra Fernandez said. Many veterans already were mourning the loss of fellow Vietnam vet Sen. John McCain, who died Saturday. After crews tried to wash off the paint or marker, it appeared as if the gloss on the memorial was permanently damaged. "It hurts inside that somebody would do this," Dennis Fernandez said. "I don't think they know what they were doing. I wouldn't be surprised if some of their grandparents were in that war." Others who also honor the memorial are equally sickened by the vandalism. "It's disgraceful, particularly in this country where veterans are highly regarded," resident Alfred Lee said. Sandra Fernandez said the foundation has contacted someone who can possibly restore it, and they're looking to do it as quickly as possible. It's the second time the memorial has been vandalized in the past three years. Previously, someone put red paint over the names, but crews were able to clean it off and repaint the names. The foundation says it hopes donations will cover the cost of the latest repair.